The Pont d'Arcole is just downstream from the Pont Louis Philippe between the Ile del la Cite and the Right Bank. Like several of the bridges over the Seine, it was named after one of Napoleon's victories. It is a 80 m (263 ft) long single span deck arch composed of fourteen arch ribs connected to the deck with triangular elements. It was built in 1856 of wrought iron, which is more ductile and malleable than cast iron. Even so, the bridge subsided by 20 cm in 1884, and had to be reinforced with steel trusses. In 1944, it was driven over by the first tanks that liberated Paris. It was more thoroughly waterproofed and repainted in 1995. 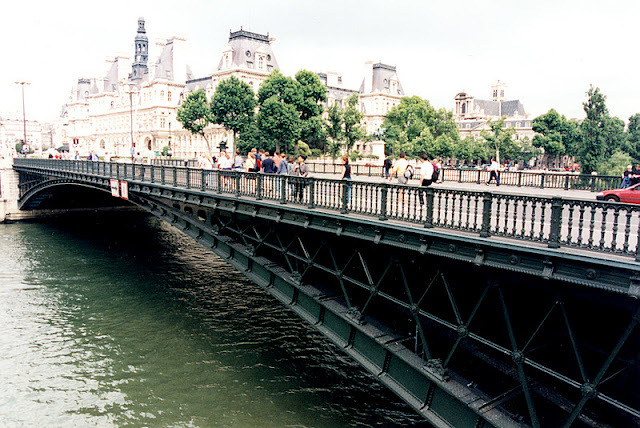 Seine River Bridges: Pont d'Arcole by Mark Yashinsky is licensed under a Creative Commons Attribution-NonCommercial-ShareAlike 3.0 United States License.